Gaëtan Brulotte. La contagion du réel. Short stories. Montreal, Lévesque Éditeur, coll. « Réverbération », 2014, 152 p., 23 $. ISBN : 978-2-924186-44-2 (print) • 978-2-924186-45-9 (PDF). 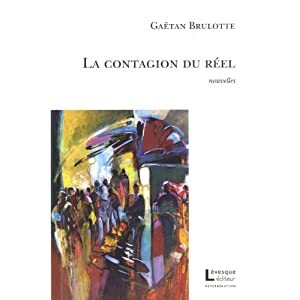 Gaëtan Brulotte is a writer that "never stopped exploring new avenues to tell the world we are in" (Michel Lord, Lettres québécoises). This new collection of stories, published in French, is no exception and brilliantly confirms it with its very inventive narratives. Humor and irony accompany the poetry of life and its tragedies, and alternate with its more prosaic or spiritual dimensions. These stories deal with subjects close to anyone's daily life, like making the bed or having a walk, taking a vacation or sending an email, writing lists of grocery or preparing a reception at home. We can read also about tormented love stories, mindless violence, as well as on petty fascisms which may poison one's life at work or in couples. Brulotte's stories offer a renewed perception of reality in all its complexity: nature and language are reexamined, as is the vanity of human endeavors or the body when suffering, dying or, on the contrary, full of life. As in his previous works, Brulotte suggests lucidity, creativity and beauty as solutions to save everything from nonsense. From one story to another, readers are invited to laugh at human frailness, to step back to take time to meditate and wonder, but also to rebel against absurd directions our world is taking sometimes. Video Interview by Laurence Grenier on this book, Paris, July 29, 2014. 8 min. In French on Vimeo or Youtube. -The 2015 Gerald-Godin Literary Award, Quebec, Can, May 2015. -Selection and showcased by the Quebec Bookstore in Paris, Aug. 2014. -“A fascinating collection.” Les Libraires 82 (April-May 2014) : 14. -“A great book.” Daniel Rolland, culturehebdo.com, March 2014. -"An interesting exploration of the ordinary" Anne Bert, Salon littéraire, Paris, Sept 2014. -"exploits one of his preferred means of expression: a bitting irony" Michel Lord, Lettres québécoises, Winter 2014-15. -"The human condition in all its contrasting facets." Philippe Bilger, Justice au singulier, Paris, July 2015. -"Life style and writing style are merging here, and this union represents an admirable display of authentic humanism." David Dorais, XYZ. La revue de la nouvelle 123 (2015). -"This new collection of stories confirms the importance and value of this writer's work, as he is considered one of the great masters of contemporary short story in Québec." Margareta Gyurcsik, Dialogues francophones, Romania, 2015. -"None of Brulotte's short stories are alike. Of a constant literary quality, they are characterized by their formal originality, the singularity of their tone and themes. The sense of reality still prevails over fantasy, which appears only with the presence of emotion." Ginette Bernatchez, Québec français, 173 (2014) : 88. -"Art de vivre and art of writing are one here, and this union represents the admirable manifestation of an authentic humanism." David Dorais, XYZ. La revue de la nouvelle 123 (2015 : 91-95. For more reviews, see the French page on this book by clicking here. Gaëtan Brulotte has authored some fifteen books including The Secret Voice, Double Exposure and Life Sideways. His works have received as many literary awards in Canada and France, including the Robert-Cliche Award, the Adrienne-Choquette Award, the France-Québec Award, the Radio-Canada Drama Prize. In 2014 in France, he was made Knight of the Order of Academic Palms for his contribution to the promotion of French language, culture and literature and for 2016-17 received a Fulbright Award for the US Government.